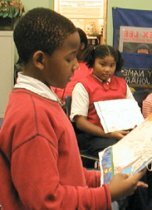 Nonfiction books help children learn about the world around them and about themselves. Better yet, kids of all ageseven young childrenlove to read "true" books. For younger children, exciting photographs and illustrations make the facts come alive. For older children, maps, photographs, drawings, and charts help teach new and familiar concepts. Here’s a selection of nonfiction books for children at all stages of reading development. Rhyming text and large color photographs, along with facts about trains, will intrigue children, especially those who love trains. In the series Many Cultures, One World, simple facts, maps, and photos, along with recipes and art projects, help young readers understand other cultures. The I Spy Series is popular with kids who enjoy solving puzzles. Kids search for pictures of objects within the large picture. The large color photographs in the books are intriguing to young children. Cheney goes through the alphabet with a famous woman for each letter. Scientists, politicians, writers, and others are included. The Then and Now Series compares the ways people live now with the ways they lived in the past. This book, for instance, shows a picture of a telegraph machine and of a computer connected to the Internet on facing pages. The Rookie Biography series provides basic information, maps, and illustrations to give beginning readers their first experiences with biographies. The Magic School Bus series recounts the adventures of Ms. Frizzle and her class as they travel in their school bus to explore various places in the environment--the earth, dinosaurs, under the sea, and more. The series Our Galaxy and Beyond contains many color photographs and graphic images along with basic information about the planets. Wording and information are appropriate for the transitional reader. Zeifert plays off the song "Dem Bones" to give readers good information about the human skeleton. This book presents facts about the mysterious 1947 UFO sightings in Roswell, New Mexico, as well as a bibliography and websites that provide additional current information. Illustrations, text, and maps give up-to-date information about dinosaurs from the Late Triassic Period through to their demise in the Late Cretaceous period. A detailed text and excellent reproductions bring Salvador Dali’s works to life. The works of Dali’s contemporaries are included, as well as 21 activities that encourage would-be artists to view their surroundings in new and different ways. This book contains interviews with, and the recollections of, scientists, astronauts, ground crew, and journalists involved with the space program since 1940. These excerpts come from Quest, a quarterly journal of the space program.